The first night we arrived at Arrowhead we set up camp and made our dinner. Within less than an hour we were in the middle of a full on thunderstorm complete with a ridiculous amount of rain. I remembered that our firewood was sitting on the ground so I ran outside to move it into the back of the truck and stepped into a small river of water running through our site. This isn't one of those fishing stories where the minnow that was caught turns into a 9 foot beauty. 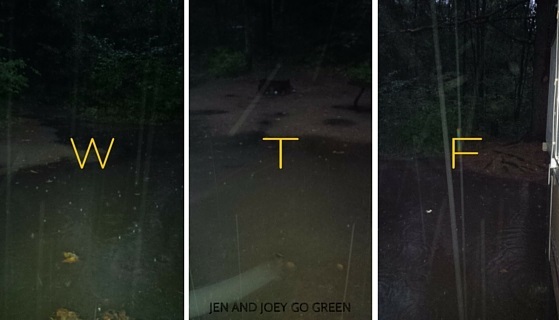 There was at least 6 inches of water that had accumulated and covered 50% of our site. Thankfully, we were dry inside and in the morning all the water had receded. Arrowhead is really about car camping and does not have any back country sites. The park is divided into 3 campgrounds, which are all very different. East River offers electric and non-electric sites that are large and very private. You do not have to worry about being close to the comfort station because the toilets on each circle are very well kept. The Lumby campground is only non-electric sites and there is no privacy. The campground is hilly, and what I remember most about camping there as a kid. All campgrounds in the park are close to the lake, river and hiking trails. There are some campsites that offer lake views or are close to the river. There are a lot of evergreens in the park, which did attract a lot of bees to the camp sites. There are a lot of hiking trails at Arrowhead, so many that we didn't get to all of them. Their length and difficulty varies, offering hikers of any skill level a number of different routes through the park. This park is made for cycling and most trails allow you to ride on them. This really does extend the range that families can go exploring in the park. We went when B was too young to take trail riding on his own bike but if we were to return we would absolutely explore the park fully from our bikes. When it comes to hiking, the trail we used the most was Stubbs Falls because it was easy, not too long and takes you right over the Falls. We went back several times doing all or part of the trail each time, just to spend time at the Falls. You can get to the waterfalls via the Stubbs Falls trail or a canoe down the Little East River from the canoe rental area. Wear the right foot protection because the rocks can be slippery and you do not want to fall into the river. 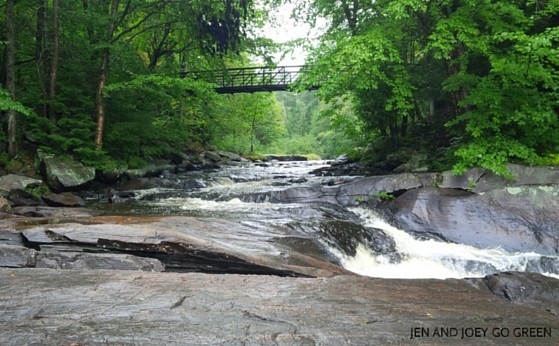 Bring a blanket and a picnic lunch and find a nice spot where you can watch the waterfalls. It is a quick walk to the Lookout so it can get busy. Go early in the morning when you can enjoy the view on your own. The history of the bow and what led to its current state is pretty interesting so the park has detailed it on all plaques at the Lookout. Arrowhead Lake was like glass the whole week we were there making it perfect for canoeing. The lake isn't too big so you also have the option to head up Little East River or Big East River. 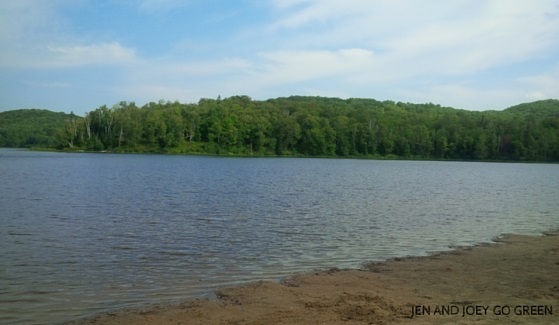 There are only a few Provincial Parks in Ontario that you can go to at different times of year and swear that it is a completely different park then when you were last there. 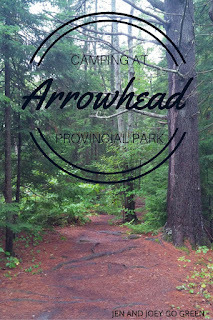 Arrowhead Provincial Park is one of those parks. The park is open year round, home to numerous winterized yurts and a fantastic outdoor winter activity program. Arrowhead is a good car camping park and while it doesn't have enough activities to bring us back for a full week, it would be a park that we would visit again for a weekend. 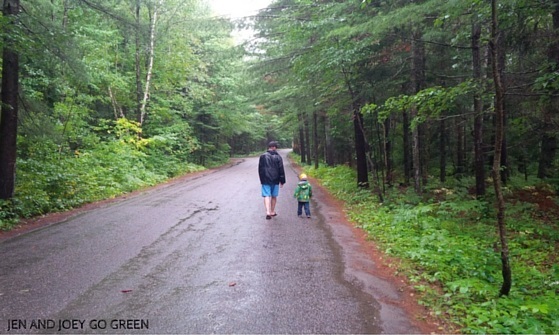 Follow along with my camping series as we try to camp at all Provincial Parks in Ontario. You can find my other posts here. Fantastic article! 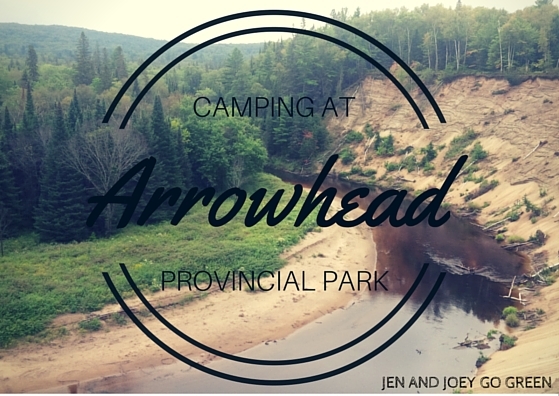 Thanks so much for sharing your experience at Arrowhead Provincial Park!